Food Corporation of India (FCI) Board have given an Notice about the FCI Assistant Grade III Recruitment 2019 @ www.fci.gov.in Notification and have offered the huge number of the Jobs like the 4103 Junior Engineer (JE), Assistant Grade-II (AG-II), Steno Grade-II, Typist (Hindi) and Assistant Grade-III (General / Accounts / Technical / Depot) Post for the VCandidets who are interested in it. The Starting Date to fill up the FCI Assistant Grade III Application Form us the 23rd February 2019 and the ending date is the 25th March 2019. Most important Information of this FCI Assistant Grade III Notification Including the all the eligibility criteria and the Syllabus, Previous papers is also attached Here. Now the candidates needed to check out their Eligibility and then needed to apply for this FCI Assistant Grade III Jobs within the Mentioned end date. The Starting date to fill up the online FCI JE Application Form is the 23rd February 2019 and the links will be activated on the day itself. In the between of this Time, the Candidates needed to check the eligibility like the Educational Qualification, Age Limit, Selection process, Vacancy Details, Application Fee, FCI Assistant Grade III Salary, Important Links & application Form Filling dates all will be gathered here about his FCI Assistant Grade III Recruitment 2019. Those who are thinking to get settle their life in the central Government Jobs, then the Candidates needed to know about this www.fci.gov.in Recruitment 2019 Process Surely. If Candidates get al the confirmation Details about this FCI Assistant Grade III Jobs, then they needed to fill up the Application Form. To fill up the Application Form for this FCT JE Recruitment 2019 is a very simple Process if they have read out all the rules and instructions about this Jobs on the Notification or from this page. While uploading the Candidates documents like the photograph, signature and the important files, the size limit in the form of the pixels that are clearly Given on the FCI Junior Engineer Notification, then only the application will only be acceptable. Those Candidates who have uploaded the false documents in the application, they will not eligible to take the participation in the selection Rounds and the severe action would be taken by the Higher Board. After completion of filling up the FCI Assistant Grade III Application Form, the Candidates needed to take the print out of that form and then keep it safe to get the admit card & Result Status. The selection Process based on the Postcode wise is conducted. For this FCI JE Recruitment 2019, the Candidates who are going to apply, they all needed to complete their Graduation/Diploma Form the Recognized Board or University with the Minimum Qualifying of the Marks. Candidates for the Posts of the FCI Assistant Grade III Recruitment, they have the computer Proficiency is necessary. 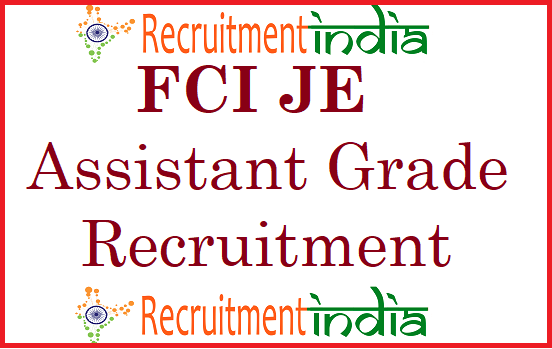 Total FCI Assistant Grade III Recruitment Jobs- 4103 FCI JE Posts Based on the Region Wise. The genuine Information of this Food Corporation of India JE Jobs we have given here which is taken from the notification that is released by the Food Corporation of India Board. Our @recruitmentindia.in page work is to Provide the necessary Details about this Jobs for the Candidates in a convenient Manner. So that they can easily trust this Jobs and may apply if the candidates had all the Desirable eligibility only. Due to the ineligibility factor in the Selection Process, the Candidates may not get the Jobs. The Detailed FCI Assistant Grade III Notification we have linked up in this page or they can check into the Officials page for more Details of this Posts. All the basic requirements that are needed for the candidates to Apply for this FCI Assistant Grade III Recruitment Posts gave Here. Food Corporation of India (FCI) Board through the Process of the FCI Assistant Grade III Recruitment, they have offered the Junior Engineer (JE), Assistant Grade-II (AG-II), Steno Grade-II, Typist (Hindi) and Assistant Grade-III (General / Accounts / Technical / Depot) with the FCI Assistant Grade III Vacancy of 4103 Jobs. As this is the fresh vacancy that is released from the FCT Board this Year. The Board is going to give the employment Opportunities for a lot of the Candidates for this FCI Assistant Grade-II Posts, those who had all the Desirable Qualifications Only. First carefully read out the FCI JE Notification and then based on the Candidates region wise they have to select the Jobs and then apply for it. The Admit card for this Jobs will be given by the board through the Candidates Given Email ID or Phone Number. So that mention the Valid details on the FCI JE Application Form. The post FCI Assistant Grade III Recruitment 2019 | Apply For 4103 Assistant Grade-II & JE Jobs @ www.fci.gov.in appeared first on Recruitment India.